The drip coffee packs are the easiest way to get your cup of delicious coffee while on the go or at the office. Simply open the package, hand the filter onto your favorite cup, and add 200ml of water just off boil! Each pack comes with 12g of coffee and each box includes 10 packs. Leticia and Lorena are the current stewards of the farm. Under the guidance of Family Bonds, the current harvest sees the release of a new hybrid processing option to their prized Pacamara varietal. They have taken a small percentage of their already small volume of Pacamara and applied a hybrid processing technique. Using the natural process to kickstart the fermentation, coffee cherries are then re-hydrated and prepped for depulping and drying by immersing the fermented cherries in cold water for 2-3 hours. Drying is finished with a combination of raised beds and mechanical drying. 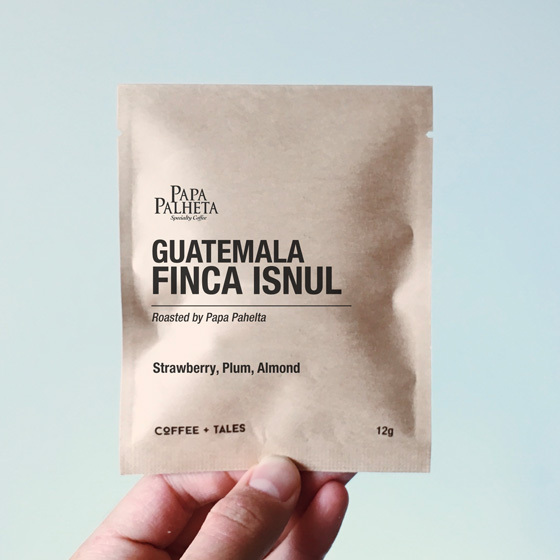 This unique process not only creates a unique spectrum of flavours but retains the crispness and vibrancy that is the hallmark of Finca Isnul.